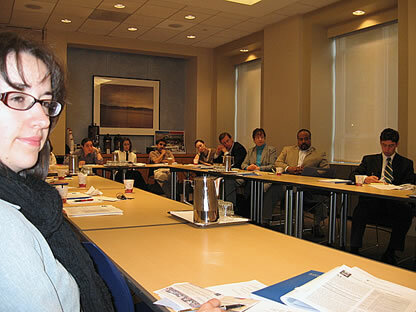 Haiti Study Group, Haiti Democracy Project, April 13, 2010, held at Brookings Institution, Washington, D.C. Ambassador Preeg convened the meeting and introduced the speakers. The items to be dealt with would be the Haitian plan for national salvation and the plan and mechanisms officially launched at the United Nations on March 31, 2010. The New York plan was attributed to the government of Haiti with major technical input from foreign experts. Foreign donor nations pledged an unprecedented $10 billion. The Haitian Strategic Plan for National Salvation originated in a conference of thirty-three Haitian experts held in Santo Domingo last August 28–30, 2009. The event had been co-sponsored by the Haiti Democracy Project and the League of Haitian Pastors in the Dominican Republic. Among the Haitian experts had been a former finance minister of Haiti, former commerce minister, former ambassadors, senators, and an inspector-general of police, presidents of national and regional chambers of commerce, presidents of peasants’ and womens’ associations and religious federations, a framer of the 1987 constitution, professors, educators, and professionals. They had come from Haiti, the Dominican Republic, the United States, Canada, and France. Joining these thirty-three in the audience were several dozen Haitian students attending the University of Santo Domingo as well as many Dominican foreign ministry officials, members of parliament, religious leaders, scholars, lawyers, students, and journalists. 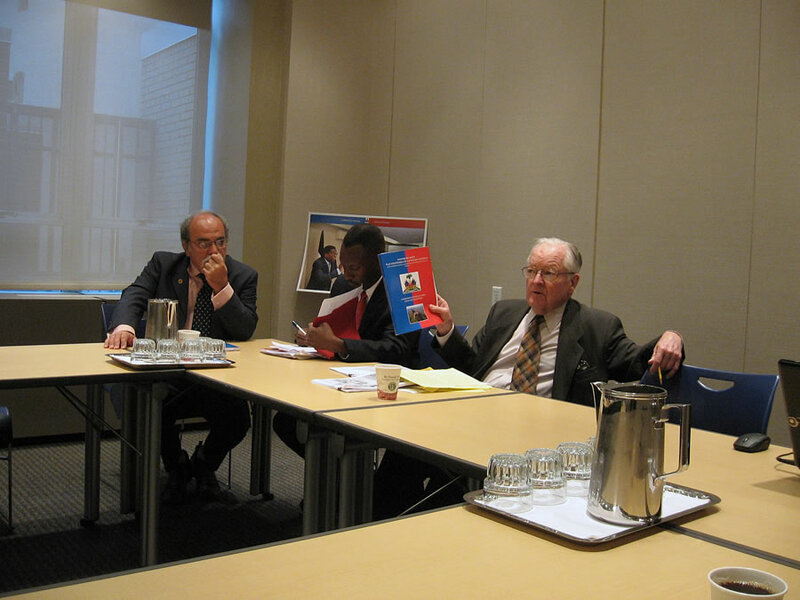 The Haiti Democracy Project itself, Ambassador Preeg noted, had not written the plan. The actual writing had been purely the work of the drafting committee, making this an all-Haitian plan. The finished plan had been first presented in Port-au-Prince on March 29, 2010 at a meeting at the La Reserve Restaurant in Petionville attended by some 150 people. Among them were civil-society leaders such as Prof. Rosny Desroche, a founder of the broad civil-society coalition the Group of 184. Gérard Gourgue, a senior legal expert. Georges Michel, a framer of the 1987 constitution. Rosny Smarth, former prime minister. Edouard Paultre, president of the Protestant Federation; Himmler Rebu, political figure and author; Senator Delpé, the political leader on the panel today; and other leaders of the major democratic formations in Haiti. The meeting today was the first presentation of the Haitian salvation plan in the United States. On the panel were three members of the drafting committee. As important as this Haitian plan was, it came in the context of the impressive response of the international community convened in New York and the unprecedented volume of resources pledged. After the Haitians drafters presented their plan, Ambassador Preeg would proceed to an analysis of the plan of New York, focusing on initiatives for improved donor coordination. Since this plan was being introduced for the first time in the United States at a Washington think tank, it was appropriate to begin by quoting another think tank analyst, Dan Erickson of the Inter-American Dialogue. Erickson said at a 2008 meeting that Haiti had a “hollow state.” A number of Haitians reflected on that term and the truth of that observation. Out of that came the Patriotic Meeting for a Strategy of National Salvation, a marathon brainstorming session the Haitians held last August in Santo Domingo. Altogether thirty-three Haitian experts convened, twenty from Haiti and thirteen from the Dominican Republic, United States, Canada, and France. From Haiti came leaders of peasants’ leagues, universities, political parties, think tanks, business, women’s associations, and churches. The meeting found that not only was the government an empty shell, but the state itself was nonexistent or empty. The reality of that became evident to all on January 12, 2010. After the meeting in Santo Domingo, eleven intellectuals received a mandate to formulate a plan to salvage the nation-state. Five months later the Strategic Plan for National Salvation was finished with a broad and detailed road map of how to build the Haitian state. The plan was sent out to forty-four thousand e-mail correspondents and in fifteen hundred hard copies in Haiti and the Diaspora. The next step for the drafting and publicity committee was to make three thousand audio CDs. Sixty percent of the Haitians could not read. A focus group would advise on how to present it to the grassroots and public in all 570 communal sections in the ten departments. The plan with its broad appeal was becoming the most unifying factor within Haitian civil society today, Senator Boulos concluded. In the wake of the January 12 earthquake, it was an automatic reaction to the enormity of the devastation to focus all attention on humanitarian aid and rebuilding. The Montreal meeting determined the scope of the effort. The UN meeting in New York determined the cost, policy, agenda, and calendar and accepted the donors’ commitments. There was no doubt that the billions of dollars allocated to the reconstruction could bring some of the world’s most advanced science and technology to the shores of Haiti.
. However, beyond the technical aspect, would the billions alone contribute to change the nature of the regime that had governed Haiti for the past fifty-three years? That was the deeper question that would determine the success of the aid, Mr. Benodin said. Fifty-three years of traditional corrupt government had polarized Haitian society, widened the gap between social classes and accelerated a brain drain. This brain drain began under François Duvalier’s regime and continued apace. According to the World Bank, more than 83 percent of Haiti’s professional and technical personnel had left the country. At the New York meeting, close to $10 billion was pledged. But in the last twenty years, had not Haiti already received more than $10 billion? What had been the result? Haiti had become the hemisphere's poorest country and one of the most corrupt in the world! Was not the United Nations, in one decade from 1994 to 2004, compelled twice to invoke Chapter VII of its charter to deal with Haiti, due to the recurrent failure of the state under this type of regime? In Haiti this regime, Mr. Benodin explained, was sometimes described as anarcho-populist. Anarchic because to maintain its own rule it destroyed the rule of law. And populist, either of the left or right, because that was the most convenient cover behind which to practice its entirely traditional power-aggrandizement and corruption. Was it in the interest of the international community and the Haitian nation to maintain this status quo? The traditional conservative argument of foreign chanceries, that is was better to stick with the “the devil you know” than risk the unknown, was not convincing in this catastrophic juncture. A change of paradigms was necessary if one were sincerely motivated by the need to extricate the Haitian people from its misfortunes! After fifty-three years, the need to break with pseudo-populist regimes of both extremes had become fundamental to the welfare of Haiti and its people. The model presented by the Strategic Plan for National Salvation offered exactly that clean break. The challenge that one faced at this juncture was to combine the physical reconstruction of Haiti with its transformation into a modern state. One needed to show the Haitian people and international community that it was impossible to build up a modern state with the very type of anarcho-populist regime that was continually tearing it down. Unless the real intent was for it to fail! Those who had witnessed and observed the last fifty-three years of Haiti’s decline were absolutely convinced that the presence of pseudo-populism in power in Haiti had brought the country’s demise. If this were not so, why had Sen. Christopher Dodd recently recommended putting Haiti under trusteeship? The senator was absolutely convinced that the existing type of regime was unable to manage a transformation into a modern state. But if the main reason for the senator’s recommendation was the inability of Haitian populism to govern coherently, the solution was not trusteeship, but elimination of such misgovernment. It would take new people with new ideas to forge a new world! 1. It was not merely a reaction to the cataclysmic destruction of January 12. It was the product of a thoughtful workshop on governance held well before the cataclysm, from August 29 to August 30, 2009 in the Dominican Republic . The Strategic Plan took a broad view, rethinking and restructuring Haiti along the lines of a modern state. 2. It was a quantum leap beyond what had been offered before. After serious reflection, the Strategic Plan laid out a list of changes in governance with concrete proposals in many domains. With these changes the plan clearly laid out the path to emancipation from the succession of pseudo-populist regimes. With reconstruction would come a certain physical modernization. But Haiti had also to modernize the way it governed itself if it was to sustain a renaissance! This modernization was a sine qua non for stability. Everyone’s help would be needed. The drafters of the Strategic Plan urged all motivated by the ideals of reconstruction and modernization to join in bringing the plan to fruition. That is, to make it truly a plan for Haiti’s salvation! It is unfortunate that the Haitian constitution of 1805, which sought to build a nation-state after our independence was proclaimed on January 1, 1804, was not, like the U.S. constitution of 1787, the fruit of a consensus among the different sectors of the new Haitian society. If it had been, it might have spared us the counterrevolution engendered by the assassination on October 17, 1806 of the nation’s founder, Jean-Jacques Dessalines, and the adoption by presidents Alexandre Pétion and Jean-Pierre Boyer (1807-1843) of an anti-national, colonial, and feudal model of society harking back to the colonial slaveholding model that our founders had just sought to eliminate. We had to wait 180 years, from 1806 to 1986, to see the collapse of this social model of exclusion and exploitation with all its consequences in terms of underdevelopment. But political instability, lack of governance, anarchy, insecurity did not cease and led finally to paartial international trusteeship of the country by the United Nations on two occasions within ten years, 1994-1999 and 2004 to date. These, after the occupation of 1915-33 by the United States. These were the unavoidable facts we cited in the patriotic meeting for national rescue held in Santo Domingo on August 28-30, 2009. by a group of intellectuals, technocrats and politicians, both women and men, living in both Haiti and the diaspora. The meeting was made possible by the Haiti Democracy Project and the League of Haitian Pastors in the Dominican Republic.The meeting was necessary in order to propose that the very re-foundation of the Haitian nation-state was necessary to escape the crisis, and this resolution was made public in a press release. After this declaration, a drafting and steering committee was set up to develop a strategic plan of national rescue aiming at this re-foundation. It is this strategic plan to build another Haiti that we have the privilege of presenting to you today in Washington. The plan was very recently and formally presented in Haiti to a select audience broadly representative of Haitian society and including the businesspeople, trade-unions, popular organizations, peasants, students, socio-professionals, politicians, and women’s associations. At the meeting, participants who had taken the time to acquaint themselves with the document took turns before the media to congratulate the authors for accomplishing something that had never before been done by Haitians. In addition, even though the plan appears to be the most finished, and the only one to date spread over a long period of twenty-five years, we must admit there are others which we cannot fail to take into account. Hence the necessity of a “Sovereign Haitian National Conference” bringing together the state, the local governments, the major social forces both inside and in the diaspora. This is the conference that the Progressive Democratic National Party of Haiti, through my voice, has been calling for for over fifteen years in order to reach a consensus and reconcile the country around a great and unique democratic project of nation-building. And it is on the basis of the document issued by this Sovereign Haitian National Conference that there would take place an international conference whose objective would be to help the country materialize the great project. In this respect, the “Post Disaster Needs Assessment (PDNA)” prepared after the earthquake of January 12, 2010, almost exclusively by foreigners and a group of Haitian government dignitaries without the input of the major forces in the country, should rather be a short-term component of the comprehensive project of nation- building. So the work of this group of Haitians who held the patriotic conference for national salvation in Santo Domingo on August 28-30, 2009, does not end with the presentation and promotion of this plan. Now, we must focus on the emergence of a new leadership at the head of the country. This leadership, in the context of a transition government, must be able to convene the Haitian national conference so that this strategic plan for the national salvation, revised and corrected with inputs from the other plans and the major forces of the country, both inside and in the diaspora, ceases to be the document of one sector and becomes a national document, a state document. This document should guide the re-foundation and rebuilding of the country over a period of at least twenty-five years, the time to prepare a new generation of men and women embodying a national consciousness that will take over and govern the country in a responsible manner, knowing that national barriers tend increasingly to disappear to make way for large groups of regional, continental and world institutions within the cultural diversity of the people. This new generation, beyond a national project, should work, in the spirit of the Haitian revolution of 1791, for a just humanity, a balanced management of the resources of the planet; in other words, work for a just world focused on sustainable green development, participating on a world scale on composing and carrying out a plan of planetary rescue. My God bless Haiti and our planet! Senator Delpé’s presentation concluded the first panel and Ambassador Preeg opened the meeting to questions from the audience. During the discussion, concern was expressed about the amount of government budget support in the U.N. plan. It was suggested that broad support for the Haitian government would be necessary, but the proper allocation of resources would be critical. Haiti came out near the top of every Transparency International corruption index. As a possible concern, greatly extended government regulations on nongovernmental organizations could be vulnerable to officials looking for a handout. NGOs needed to resist this pressure. A think tank representative asked about the relation between the two plans, the Haitian strategic plan and the New York plan. Also, would the Haitian plan coalesce into a political movement? Robert Benodin replied to the first question that one plan, the New York one, governed, while the Haitian plan reconstructed. As to the political situation, Ambassador Preeg said that a top priority for democratization and the upcoming elections should be a new, independent and representative electoral commission. The current CEP consisted only of President Préval’s people. The people in Haiti should interact with the international community in forming a new one. A U.S. participant commented in three areas. First, there was commonality between the two plans. Particularly this was so on decentralization, the environment and energy. There should, however, be more on the issue of mechanisms to bring about a national dialogue. The Agency for International Development had supported forums on decentralization. Earlier, the Haitian executive branch had blocked them, but since the earthquake this appeared to have changed. The forums were favored by Haitian senator Youri Latortue. Second as to the Haitian plan’s call for a new military, navy and marines. What was the nature of the security threat? Was it a lack of law and order, and did it call for a response at the level of police? Third, would the objective be re-construction or construction of a new Haiti? In the aftermath of the earthquake, there had been a total absence of a coherent government response. This raised the question of how to channel international support. Ambassador Preeg responded that on point 3 it would be both construction and reconstruction. On point 2, the Haitian plan drafters responded that Haitian police were now inadequate, and were generally not present in rural areas. They had no capability to respond adequately to actual catastrophes such as floods. Senator Boulos recounted his conversations with peasants in the department he represented, the Nord-Est. He had asked them why they no longer kept livestock as they had always done. They said it would be stolen while they slept. There was no rural security. Thieves had impunity. Senator Boulos added that while the international community might be skeptical about bringing back the Haitian army, it must feel the need for some army because it had twelve thousand of its own troops there now. Robert Benodin replied to the questions about decentralization and the police. In 2007, the Préval government stopped the local-delegate elections that would have allowed the localities to create the permanent electoral commission mandated by the constitution. Keeping this commission in the hands of the president in Port-au-Prince was intentional. As to the police, the Haitian National Police was an urban police. The peasants were not protected. The result was that food was brought in from the Dominican Republic. A participant noted that, as well as having served in the U.S. Air Force, he had been a captain in the Haitian army. When the earthquake struck Chile, the Chilean army went into action. Whether in Haiti, the Dominican Republic, or anywhere in the world, a disciplined force was needed at that moment of catastrophe. On January 12, he went on, a group of former army officers went out to clear the streets of debris. Reestablishing the army to help the police was necessary because the police were non-performing. The international community evidently agreed having sent twelve thousand soldiers there itself. Ambassador Preeg said that on point 1, the decentralization forums favored by AID and now apparently the Haitian executive, the hugeness of the sums being mobilized ought to give more leverage to insist on reform. Perhaps the Agency for International Development could look at this Haitian plan, integrate it into the U.N. one, and have a dialogue with Haitian civic leaders here. 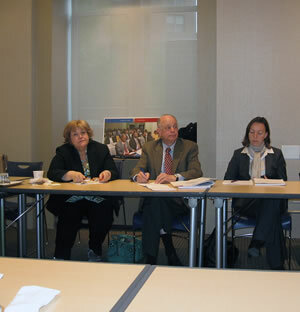 The ambassador proceeded to the second item on the agenda, the New York plan’s initiative for donor coordination. On March 31, United Nations member states and international partners pledged $5.3 billion for the next eighteen months to begin Haiti’s path to long-term recovery from the January 12 earthquake. Over 150 countries and international organizations gathered at UN headquarters for the International Donors’ Conference Towards a New Future for Haiti. The conference yielded more than $9 billion for Haiti’s reconstruction and to support essential social services, governance and broad-based sustainable development, and to defend against natural disasters. Of this amount, more than $5 billion was pledged for 2010 and 2011. 1. The Interim Haitian Reconstruction Commission (IHRC, Commission Intérimaire pour la Reconstruction d’Haïti), which after eighteen months would be replaced by a Haitian Development Authority (HDA, Régie pour le Développement d’Haïti), to establish priorities for international assistance and to coordinate, expedite, and implement it. In the interests of greater transparency, the IHRC was to have a monitoring and transparency unit to be accountable to the people of Haiti and the international public. 2. The Multi-Donor Trust Fund, for which the World Bank would act as fiscal agent, to channel significant assistance resources more effectively and to enhance coordination. (Fonds Fiduciaire Multi-Donateurs [FFMD].) Participants agreed to concentrate on priority sectors in close coordination with the government of Haiti and other donors. The interim commission’s mandate was to carry out the “Action Plan for National Recovery and Development of Haiti,” bearing the stamp of the government but evidently owing much to foreign experts. The fifty-three-page plan was released on March 31. The commission would seek out projects compatible with the plan, but would consider external submissions. It would be co-chaired by the prime minister and former president Bill Clinton, as U.N. special representative, assisted by an executive director. A board of approximately twenty members would consist of about half Haitian members and half foreign donors. The president of Haiti would have veto power over all decisions of the IHRC. This trust fund would ensure donor coordination, match needs to availabilities and assemble projects too big for a single donor. It would be administered by the World Bank. Not all funds, whether from bilateral and multilateral agencies or NGOs, would pass through this multi-donor trust fund. As of March 31, the date of the conference in New York, the considerable work to reconcile the differing mandates of the IHRC and the multi-donor trust had yet to be done. This, Ambassador Preeg said, was what was agreed to in New York. Referring back to the Haitian strategic plan, it also had an international bank to fund Haitian development. This bank was parallel in concept to the multi-donor trust fund of New York. There were also parallels in coordination issues that would arise in both plans. Reviewing the New York plan, Ambassador Preeg found a lack of clarity in voting rights in the IHRC. It was not clear from the text whether the Haitian government had three or six voting members; consequently, it was not clear whether Haitians could outvote foreign donors. The foreign lineup also raised questions. The United States appeared to have the same voting power as Venezuela. Normally, funds of this nature were operated by consensus. There was thus a real question as to how things would be decided by this commission. The status of the IHRC executive director was also unclear to Ambassador Preeg. Who would it be? Would he or she be Haitian? How independent would he or she be from the Haitian government? The question of independence for a capable, professional, and impartial director could be of decisive importance in Haiti. Turning briefly to the multi-donor trust fund, Ambassador Preeg remarked that its membership and operating procedures were not yet clear. Then turning from the New York mechanism to the plan itself, he said that its emphasis on budget support would be a continuing issue for assessment. A Haitian lawyer said that the Haitian people had had no input on this board mechanism. She considered it one of the most undemocratic moments in Haitian history. The participant said that total pledges for the New York plan totaled $10 billion. But only 20 percent of the pledges made at the last major pledging exercise had ever been disbursed. It would be necessary to track the pledges. They all had to be approved by legislatures, including his own. The participant considered the Haitian strategic plan to be excellent. As for the New York plan, the participant said that the stated intention of the U.S. government was that the government of Haiti would run the show. The U.S. government was in effect saying that, without doubt or dissent, it would give the say to the Haitian government as the leader. Another U.S. participant noted that one could consult the Office of Management and Budget website and see the U.S. government appropriations submission to Congress. The United States recognized Préval and Bellerive and would be working hand-in-hand with them as the Haitian authorities. The participant said that the seminar had raised certain flags pointing at inconsistencies in the approach. One might do a paper to summarize these points. This participant referred to the budget support as a decision that had already been made. The question was how conditional it would be. Earlier, the U.S. government had set conditions for budget support such as an independent electoral commission, the naming of a supreme court chief justice, the naming of a judicial council. There was a question as to whether it was still setting such conditions. Ambassador Preeg said according to the New York plan, over the next eighteen months $1.2 billion would go as budget support to the government of Haiti out of total costs of $3.9 billion. (Action Plan for National Recovery and Development of Haiti, p. 45). This was a very large share and should be analyzed in greater detail to see to what extent government payrolls would grow. A participant from a leading think tank noted that a nongovernmental coalition at the New York meeting proposed that NGOs help determine how the funds were used and assure they went to the right sectors. There was an opportunity to do coordination. Neither the Haitian nor the New York plan had a mechanism for it. The director of a church-based aid agency noted that in Haiti, NGOs substituted for the absence of a functioning government. A Haitian lawyer thought that there should be an independent body of the civil society to oversee the NGOs, not the World Bank.